It’s National Running Day today (and my Dad’s birthday!!!). National Running Day is a day to celebrate your passion for running or perhaps even to make a change in your life and to join the current running craze. Last year my goal was to challenge myself and to find inner-strength. This year I run for happiness and positive energy. Since running the Boston Marathon this year I have been feeling a renewed energy on every run. I am focusing on the positive energy that running brings into my life to make me healthy and strong in mind, body and spirit. I am not currently training for a marathon but have other goal races planned including some mountain races (Mount Washington, Loon . . .) and also my first Olympic Distance Triathlon (and probably more triathlons!). Since many of these races will be totally new experiences the pressure of the clock is off. Being a “newbie” going into a race the first goal is always to finish and feel like I did my best, to finish with a smile. I have no personal best times to compare to in most of these races which has taken off the pressure and added back in the fun of running again. Training and trying to qualify for Boston is amazing but can also make you feel like you are in a giant pressure cooker, making it impossible during most of your training to not be keenly aware of the time on your Garmin (GPS watch). Today on National Running Day (June 4) I will complete my planned training run (50 minute base run) but will be focused solely on the running and feeling good and enjoying the happiness that fills me up as I run. I love the amazing scenery on my runs. I am happy when I encounter wildlife on the trails (well, maybe only the smaller creatures . . . birds, salamanders, chipmunks. I am happy when I run in the warm rain. I feel energized from a good sweat. I love a great endorphin rush. I am happy for downhills and hard uphills conquered. I love the sweet smells of spring and on the trails. What makes you happy when you run? 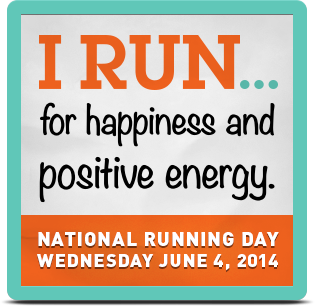 Have a great National Running Day! Your list is thorough! Haha I love how you emphasize the positive energy you receive from running (whereas many people simply focus on the energy exhausted). Way to go! I am celebrating running day by setting a new running goal: 10k! Because running DOES give me energy, and makes me feel alive. Meredith@ DareYouTo recently posted…RUN! And run further. For a good cause. I think National Running Day should be everyday . . . and a paid holiday. With a parade and fireworks and free high-fives. 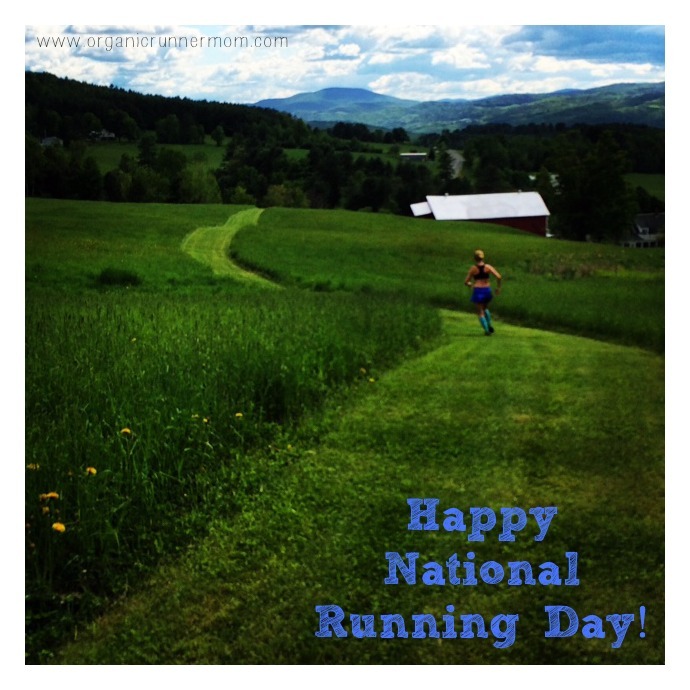 organicrunnermom recently posted…Happy National Running Day! I miss running! Have fun! I will be running and counting my blessings that I can run! Seeing other runners makes me happy! Happy National Running Day! Right now I seriously love everything about running. Training, the feeling, the scenery, running friends, speedwork, hill workouts….all of it! 80s hair bands and time to myself. Those are good reasons to run for me. I love the fresh air and the endorphins. How exciting that you’re doing a tri! Happy Running Day! I run to challenge myself! I run just because! Today I’ll be running a few miles, first since my marathon, just to see how these old legs are recovering. Lately I’ve been running with my son – that really makes me happy! Michelle @ Running with Attitude recently posted…Happy National Running Day! Happy National Running Day!!!! I love the way I feel running these days…just happy and blessed to be out there! Love this post! I am so very much loving hearing why others run and seeing all the pics posted this morning! Oh wow what makes me happy on a run? When my body is warmed up and I get my pace down. That makes me ecstatic. I also love it when I conquer hills and I like the quiet time to be all up in my thoughts and head. Diatta @ Femme Fitale Fit Club recently posted…Featured Mr. Fit: Jess Perreca, Jr. I run because it is my me time. I allows me to think, to get over stress, to just be. That makes me happy.